I have harvested all my pumpkins and gotten started on my Thanksgiving decor. Some are still growing, we’ve had a very long fall this year but Thanksgiving is approaching and the squirrels are eating them all. I thought that they’d be safe on the front porch but no. The squirrel repellent I bought does not work very well. It’s not surprising given that it is both kid and pet friendly (it’s basically a mix of garlic and other scents that squirrels don’t like). We used to have foxes in the neighborhood, so we didn’t have squirrels or rabbits. Now, the foxes are gone and I wish they’d come back. The squirrels dig through the pumpkins to get to the seeds and the rabbits ate all my early spring crops last year. So I rescued a few pumpkins, after all I have been growing them for 6 months now. And I placed them on the front porch and around the house. Check out my Halloween post to see pictures of my carved pumpkins this year. I sprayed painted a handful of the mini ones. They look so pretty bathed in the afternoon sunlight in my front room. I know from experience that a spray-painted pumpkin can last for up to a year. I kept one on the mantel of my fire place for a whole year and found it completely deflated a few days ago. They will do best in a dry and well ventilated location. Make sure to wash and dry the pumpkins carefully and let them cure in the sun for a few days. A window sill will do if you have a lot of squirrels. 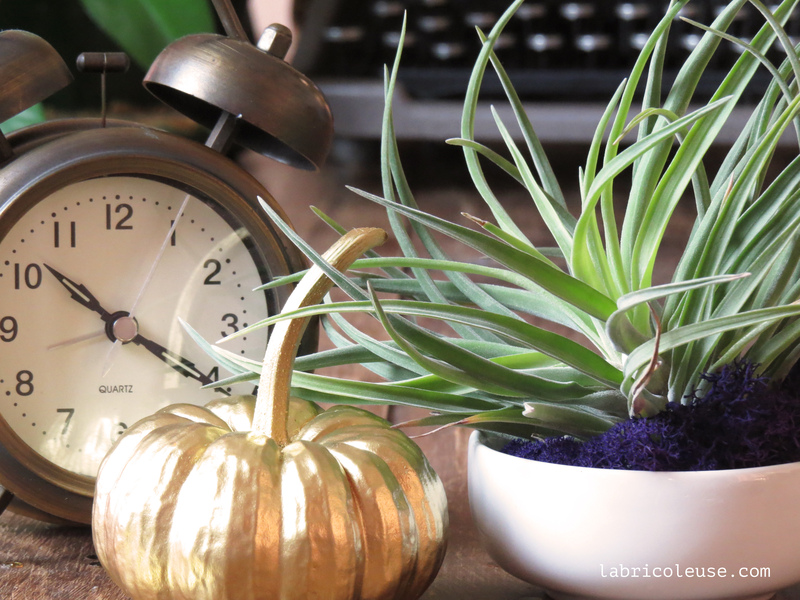 In the photo above, I staged a composition with a painted mini pumpkin, my alarm clock, and my biggest air plant. You can see my old Underwood typewriter in the background. I love this machine, someday, I’ll have it cleaned up and fixed. It’s basically a large spider house at the moment. 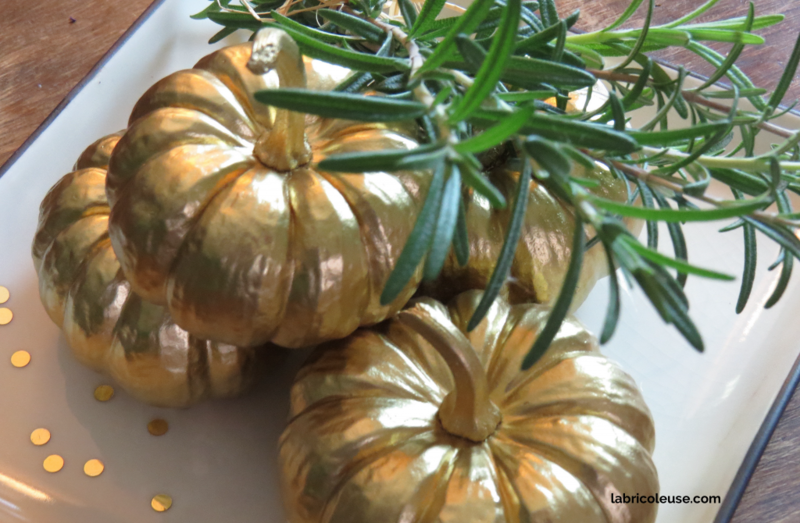 On Thanksgiving, I made a center table with painted pumpkins, rosemary and some glitter. 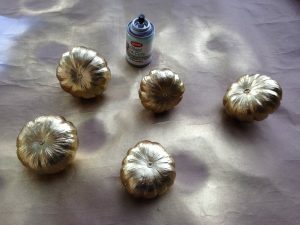 After Thanksgiving, I’ll paint the pumpkins white and sprinkle them with glitter to make a Christmas display.